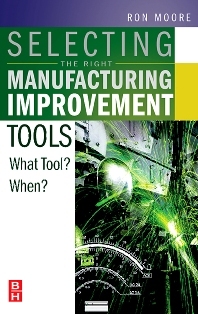 Selecting the Right Manufacturing Improvement Tools offers an easy-to-read and comprehensive review of the most important current industrial improvement tools that every manufacturing or industrial executive, operational manager or engineer needs to know, including which tool to use for a particular type of manufacturing situation. But his book goes beyond a simple comparison of improvement tools to show how these tools can be implemented and supported. Instead, it offers a broader strategic explanation of how they relate to one another, and their relative strengths and weaknesses in the larger context of the entire enterprise. It demonstrates how to use these tools in an integrated way such that they are not just be viewed as another “program of the month” or management fad. Selecting the Right Manufacturing Improvement Tools guides the use of these individual management tools within the need for aligning the organization, developing leadership, and managing change, all for creating an environment where these tools will be more successfully applied. Provides an excellent review of the most popular improvement tools and strategies - Lean Manufacturing, Kaizen, including 5S, Kanban, Quick Changeover, and Standardization, Total Productive Maintenance, Six Sigma, Supply Chain Management, Reliability Centered Maintenance, Predictive Maintenance (or Condition Monitoring), and Root Cause Analysis. Describes the foundational elements necessary for any tool to work - leadership, organizational alignment and discipline, teamwork, performance measurement, change management, and the role of innovation. Concludes with a recommended hierarchy for the use of the various tools, and provides enough information so that individual circumstances and issues can be related to these improvement tools, making better decisions and having greater business success. Introduction The Scene The Response The Tools Lean Manufacturing Cost Cutting – Does It Work? Why Do Executives Persist in Cost Cutting? Ron Moore, P.E., is the managing partner of The RM Group, Inc., and an internationally recognized authority on reliability, manufacturing, and maintenance strategies. He has also been president of Computational Systems, Inc., a supplier of instruments and software to manufacturing companies. Moore holds BS and MS degrees in mechanical engineering from the University of New Hampshire and an MBA from the University of New Haven and is conversational in Russian.